By creating a floor level entry or entry via inclined ramp, wheelchairs can roll into a shower area. Adding a shower chair or shower seat will create the ultimate handicap showering environment. Wheelchair accessible showers are beneficial to anybody that may be wheelchair bound. The ability to shower, without the help of a nurse or loved one, is important for a person to maintain their dignity. These showers are specially built to allow an opening wide enough for a wheelchair to easily get in. These showers are designed to eliminate any kind of bump or curb, which could cause problems for somebody in a wheelchair. The showers are equipped with handicap accessible seats and bars to allow a person to safely move from the wheelchair onto the shower seat. There are a number of different designs available. The showers can be fitted to any bathroom style. If the shower space is big enough, a person can also remain in their wheelchair during the shower. They will need to have a rust resistant handicap shower chair. More wheelchair shower features include strategically placed shelves at the right height that provide even more freedom for a wheelchair bound person. This allows someone to sit and still be able to reach soap and other toiletry items. 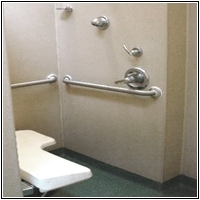 The wheelchair accessible shower pans or floors are made with special non skid material to provide safety during the transfer from a wheelchair to a shower seat. These accessible showers can be converted from existing showers or bathtubs but should have a very slight slope to ensure proper drainage and a handicap shower ramp on the outside to allow for wheelchairs to be rolled into the shower. Floor level Entry – The entry of this shower is flush with the floor level. The actual shower area dips down so water is properly drained. This option is best for wheelchair users with limited upper body strength and has trouble getting over a small shower curb. Inclined Ramp Entry – With a bit of dexterity, a wheelchair user can get over the incline. Most existing showers will setup this option because of its lower cost and quicker installation time. The important considerations when building showers for wheelchair users is accessibility and that is done by providing enough space for the wheelchair user to maneuver around. The ADA accessible showers dimensions requires a 360 degree turning range for the wheelchair in the bathroom. At minimum, there should be a 5 feet turning circle. In addition, the entry way must have a ramp or curb free entrance so the wheelchair user is not strained when they enter. The shower ramps must meet the specifications of at most 1 inch rise in height for every 12 inches. A design of 1:16 ramps reduces the incline and requires less upper body strength to roll the wheels. They are affordable and can usually be installed for under $2000 for a simple shower set up. Most insurance will not cover the full cost to install a wheelchair accessible shower, because they are considered optional, and not medically necessary.